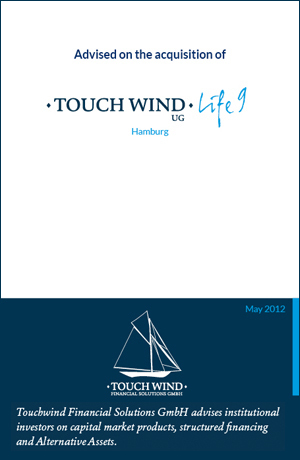 TOUCHWIND is an independent, innovative enterprise with long years of expertise of its partners. We focus on financing and structuring, evaluating Alternative Investments, and consulting in all matters of the financial and capital markets. We offer a broad spectrum of expertise acquired in leading positions in the financial sector. Our core team combines 150 years of experience in finance, investments, and capital markets. This know-how pays off for you. Our aim is to be one of the leading providers of tailor-made solutions for managers and investors in Alternative Investments. It is our passion to exceed the targets of our customers by offering optimal consultancy while maintaining the highest professional as well as ethical standards. “Customer focus, integrity, collaboration, and excellent service“ are the values which define us. Touchwind Financial Solutions advises on a fleet deal financing through Mezzanine Capital. 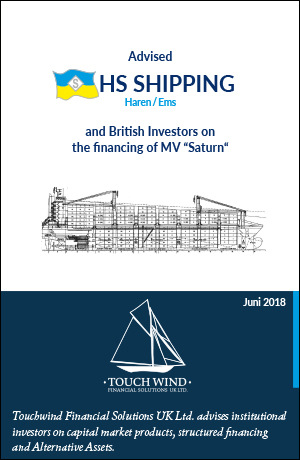 Touchwind Financial Solutions advised on the financing structure of MV“Saturn“ through foreign institutional investors for HS _ Shipping in Haren/Ems. 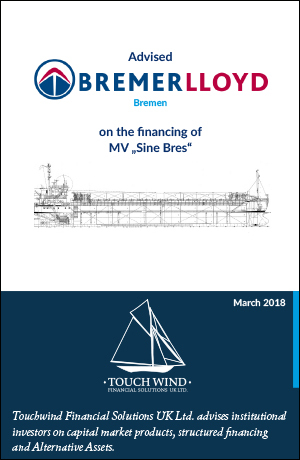 Touchwind Financial Solutions advised on the financing structure for the minibulker MV “Sine Bres"
Touchwind Financial Solutions advised on the acquisition of 3 sister vessels through Bremer Lloyd, Bremen. 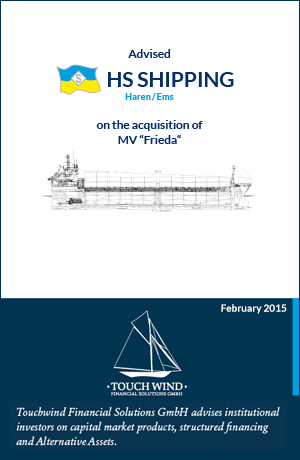 It is our pleasure to inform you about recent transactions in the shipping segment. In February 2015 Touchwind Financial Solutions advised HS-Schiffahrt on the acquisition of 3 sister ships from HSH Bank in Hamburg. The 3 vessels were put into service soon after that. Two of those vessels have recently been sold again after approx 2.5 years of stable and reliable service under the management of HS-Schiffahrt. The price of the sale realized a gain for the investors of approx 35% in the case of the first vessel and a gain of approx 63% in the case of the second vessel (after German Tonnage tax). The vessels are included in the Minibulker/Coaster shipping segment which is currently seeing hardly any new building orders. 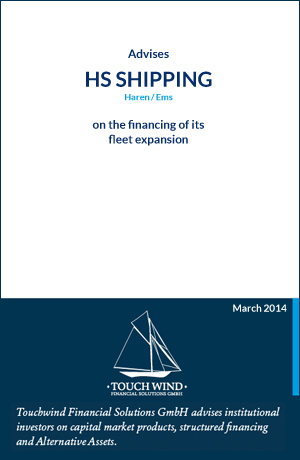 The overall fleet is aging without significant new tonnage volume on the horizon. The sale prices that have been realized are also a result of the excellent ship management job done by HS–Schiffahrt. 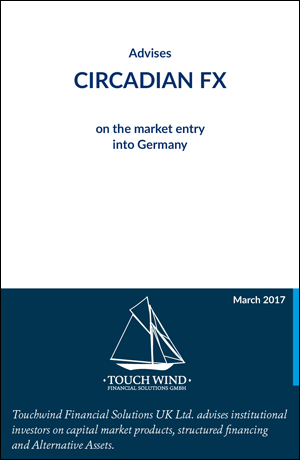 TOUCHWIND Financial Solutions UK Ltd a sister company of KOELLN & Cie GmbH & Co KG is delighted to announce that they have successfully relocated the first two German owned companies to share their location and establish a presence in the City of London. This will enable their customers and the owners to take advantage of the UK regulatory environment as well as any opportunities that may arise after the UK leaves the European Union. Dear clients, colleagues and friends, Breaking news: we have moved! As of this summer Koelln & Cie is located in Hamburg. Our newly updated website can be found here: www.koellncie.com. 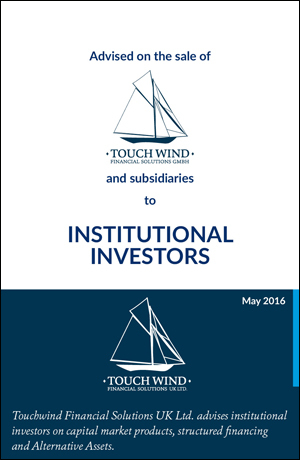 The majority of our activities will (still) be carried out under the banner of our sister firm Touchwind Financial Solutions UK Ltd which is headquartered in London. Please visit our new website here: www.touchwind-financial.com. Our main focus will continue to be Market Entry Consultancy, Product and Business Development as well as Structured Finance, specifically in the maritime sector (shipping finance) for our institutional client base. Our structure, with a physical presence in both the UK and continental Europe, means that we are ideally placed to be your partner through any developments that may occur during the Brexit process. We are currently working on Structured Financing Solutions in the Maritime Sector (Ship Financing) In certains segments we are monitoring very attractive investment opportunities (Feeder Ships, Minibulker and Multy Purpose Ships /MPPs) You are welcome to contact us for further information. 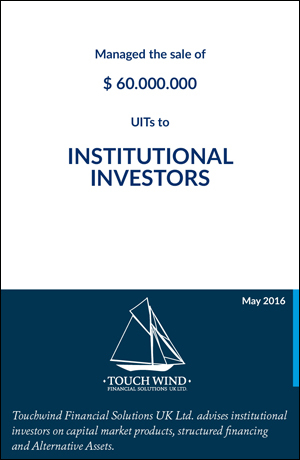 We hereby give notice that Touchwind Financial Solutions has been sold to overseas investors as of May this year. As a result of this, all of our structured finance servicing and administration operations as well as the Luxembourg based subsidiary have been transferred to the new owners. 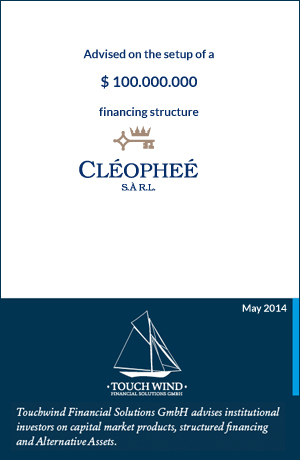 Consequently, we are now in a position to devote further resources to our main business of ship finance. The Touchwind name will continue to exist, however. 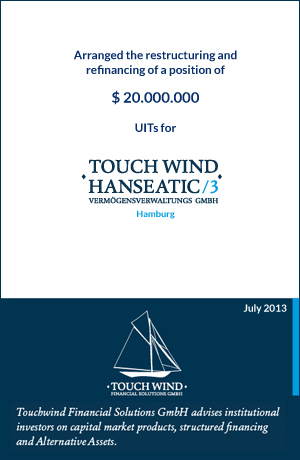 The core team will operate under the umbrella of Touchwind Financial Solutions UK Ltd., based in London, with a broad focus on structured finance and market entry consultancy as well as ship finance. We have very deliberately situated our base in London – the centre of capital markets in Europe – to take into account the ever rising regulatory burden of doing business on the European mainland. All of our clients and business partners can rely on our continued support in terms of our corporate advisory and support services. We look forward to working together in the future. Jim Tatchell is appointed Managing Director of our Touchwind Financial Solutions UK Ltd. in London. With Jim, we are able to expand our strong team, adding a partner with many years of capital markets experience. We are glad to welcome Günter Femers, an experienced banking- and capital markets executive, to our team of partners. He will strengthen our team in Hamburg, starting October 1st, 2014. Risk Management and Controlling are criticals parts when it comes to managing an enterprise. Managing Director Armin J. Lang describes in the magazine of the EOS group why risk has to be addressed at the very top of a company. 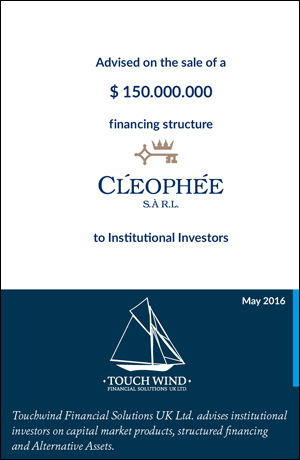 Touchwind Financial Services S.À R.L. and Ltd.
TouchWind Financial Solutions opened an office in Luxembourg and London. In large enterprises, some group units often lack liquidity while others have a surplus of funds. A cash-pooling system can balance out the accounts of these companies and give them all a fi nancial advantage. We are glad to welcome Michael Cnyrim in our team of partners. Michael is an experienced expert in the field of Real Assets, especially for ecological and Socially Responsible Investments (SRI). 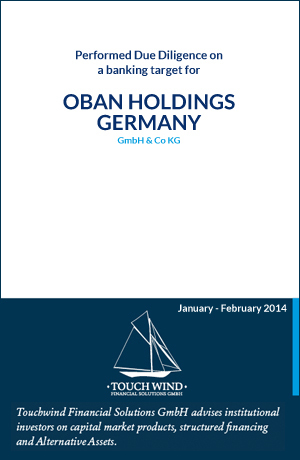 He is in charge of our Deal Screening business for Alternative Investments (COLAMIS). TOUCHWIND Financial Solutions GmbH (TFS) announces the successful completion of a complex structuring and financing, with a total volume of $140 million. With a specialty financing bank, U.S. UIT shares were financed in several Luxembourg companies, with a maturity of 3 years. In addition, existing transactions were restructured and refinanced, with a volume totaling $100 million. TFS has led the entire project, with responsibility for planning, structuring, implementing, funding, and monitoring. 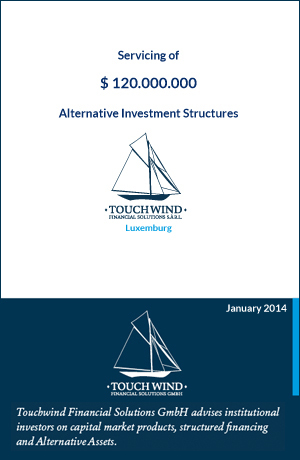 Over the past 15 months, TOUCHWIND Financial Solutions has created a total of 20 complex SPV-structures, making TFS one of the leading independent providers of structuring and financing solutions in Germany. We are glad to welcome three renowned financial and capital markets experts in our team of partners: Dagmar Buhl, Ulrich Binninger and Jürgen Popp contribute many years of experience and specialised expertise. 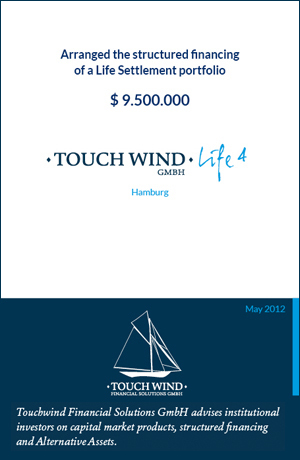 The successful business of TOUCHWIND Financial Solutions GmbH now includes Deal Screening, a new business line under the brand name COLAMIS. 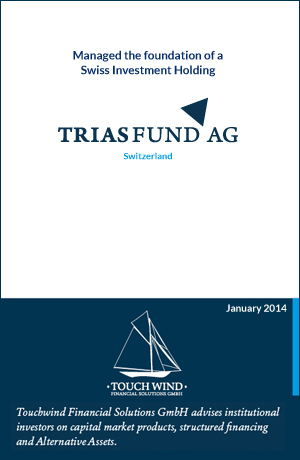 Experienced experts from different specialisations evaluate Alternative Investments for professional investors. Harmen Kölln, after finishing his studies in Hamburg, he has been working with some of the most renowned addresses in the financial markets world. During the past 30 years his focus was on the capital markets, specialised on „sales and trading“.He has many years of senior management experience in working for addresses such as Bankers Trust, Lehman Brothers and Deutsche Bank in Frankfurt, London, New York and Tokyo. Harmen acted as treasurer for Lehman Brothers Bankhaus in Frankfurt and London, where he was responsible for building the London branch. At Deutsche Bank he was responsible for money markets and short term trading activities in Continental Europe, he also served as Group Regional COO, Europe. He was a member of the Board of Managing Directors of Deutsche Bank’s London branch. 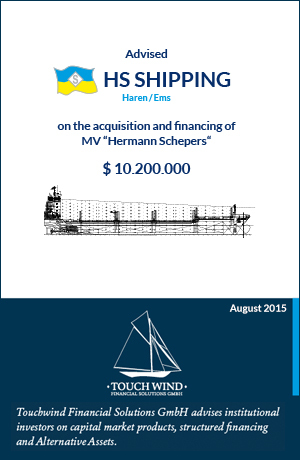 Harmen’s specialty is structured financing. Jim started his career in finance in the early 1990s as a bond trader at UBS and subsequently worked for several large financial institutions and trading houses as well as a boutique Asset Manager and latterly a global news provider. When he is not spreading the word about Tangible Assets, Jim runs his own consultancy business Tatchco Ltd which primarily assists overseas financial firms to establish a presence in London. Jim is a former private pilot, holder of a racing driving licence and rugby coach. Günter Femers has more than 30 years of experience working for globally operating institutes of the financial industry. After stations at Commerzbank, J.P. Morgan and the German Stock Exchange, he has headed Investor Relations worldwide for the HSH Nordbank over the last 10 years. He also served as Chief Financial Officer for two medium-sized stock corporations in the telecommunications sector. Communicating highly complex relations and implementing business models in a challenging capital market environment are his proven strengths. The introduction of securities lending and repos transactions are as prominently credited to Günter Femers’ name as the founding of Neuer Markt and the Stoxx-Index Family. Egon Thrun has more than 30 years of experience in heading companies as well as holding leading positions in the capital markets, securities trading and independent consulting. He has worked as a managing director, broker, treasurer and more in Frankfurt and Paris and among others for Société Générale, Crédit Agricole, Viel – Tradition Paris and Salomon Brothers. 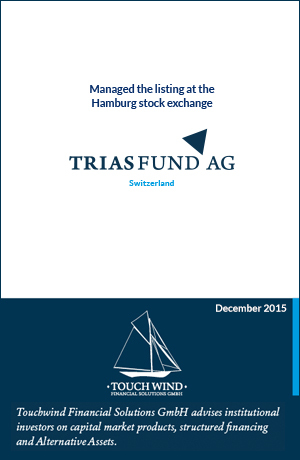 Since 2012, we have managed more than 50 transactions, with total volume exceeding €1.0 bln. You are looking for a new challenge, new perspectives? You would like to develop and advance yourself in an expanding company and contribute your commitment and potential? Whether you are at the beginning of your career or looking for a greater challenge – we offer the best opportunities for your professional future! New colleagues are characterised by professional competence, personality and passion. We are looking for people who want to move things on as part of our team. Nina Bres is visiting Hamburg. We meet MV„ Nina Bres“ anchored off Gothenburg. Touchwind advised HS – Schifffahrt, Haren/Ems on the financing of MV „Saturn“ with Foreign Investors. MV „Saturn“ is a geared 1.400 TEU Container Feeder vessel, built 2008, with approx measurements 161,30 x 25,00 x 9,50 meters. We welcome MV „Nina Bres“ as the first of a fleet of three sister vessels serving for „Bremer Lloyd“, Bremen, during a brief visit in Bremerhaven. Touchwind advised on the acquisition of 3 sister vessels for Bremer Lloyd, Bremen and co-invested in to MV „ Sine Bres“. All 3 vessels are minibulkers built in 2006/ 2007 and serve regularly between Lake Vännern in Sweden and Marocco, Spain, Holland and Sweden. 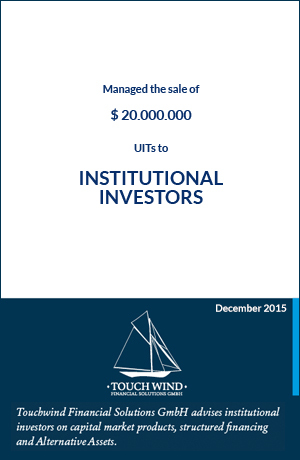 All 3 sister vessels, - MV „Clara, MV „Mia", MV „Frieda" which were acquired at the beginning of 2015 have been sold – the gain on the invested capital ranges from ca +35% and ca + 70%. 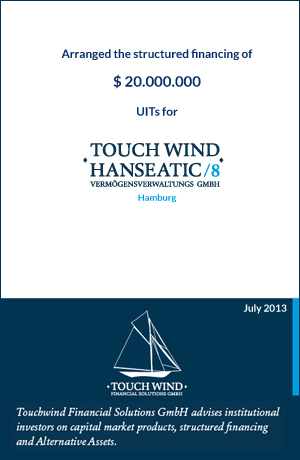 Touchwind is advising of the financing of a new build minibulker which is close to be readily delivered for undisclosed buyers. MV „Anshu“ has approx 5.500 tdw and measurements approx: 104,5 x 15 x 4,5 meters. 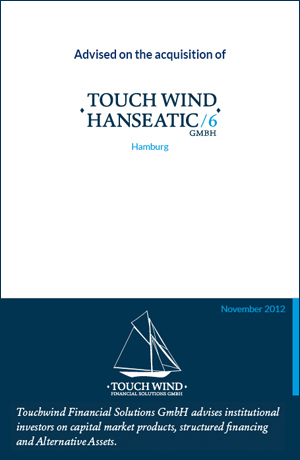 Touchwind advised on the project „BBC Kansas"- ex MV „Amber “ of HS –Schiffahrt in Haren/ Ems. 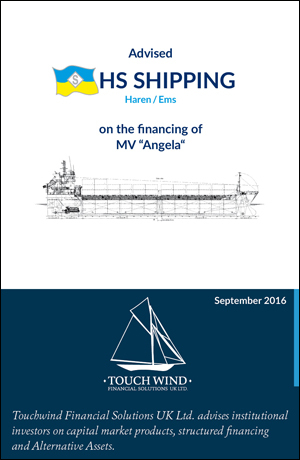 MV „Angela“ of HS Schiffahrt in Haren /Ems was refinanced. Touchwind assisted in this process and also acted as a co – investor. All 3 sister ships are getting overhauled in Gdynia/Poland and enter service sonn afterwards. Done – the 3 sister vessels where purchased and talken over by HS Schiffahrt Haren/Ems and are leaving the port after more than one year lay – up period. Please note that they already carry their new names. Together with the ship Manager HS Schiffahrt from Haren/Ems we are inspecting 3 targets which have been laid up idle for nearly one year. They show very good substance and we assist HS in the negotiations with the owning bank. Our first involvement in ship financing: HS Schifffahrt in Haren/Ems acquired the MV „Karina“ which was built in 2012.
with select group of outstanding partners. Despite diligent examination, the publisher of this website is not liable for the correctness or accuracy of the content of this homepage. The publisher is not responsible for information on sites referred to by hyperlink.